Thorne & Derrick are the leading designer, distributor and supplier in the UK of feeder pillars manufactured by Lucy Zodion – a complete range of standard, customised and pre-wired types from the Lucy Fortress range of feeder pillars are available to suit all LV Electrical Power Distribution requirements. 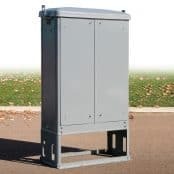 This includes power distribution pillars to provide LV electricity supply to new housing developments, multi-occupancy buildings and permanent supply kiosks for properties. Here follows an example of a Landlords Feeder Pillar specification highlighting the flexibility and capability of Thorne & Derrick to liase with consultant engineers and specifiers to meet the needs and electrical power requirements of the residential, housing and accommodation market sectors. 21.1 A new landlords service is to be provided as indicated on the drawing. 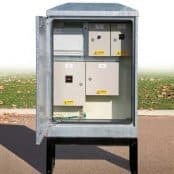 This will consist of a weatherproof secure enclosure housing a distribution board, commonly referred to as a feeder pillar. 21.2 Provide a Thorne & Derrick International landlords feeder pillar. 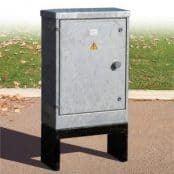 Type Fortress size 16 hot dipped galvanised feeder pillar finished in RAL 6026 complete with Yale lock and door activated internal lighting kit options. 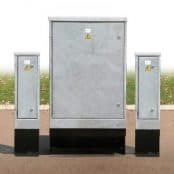 21.3 Provide a concrete base for the feeder pillar in accordance with the manufacturers specifications. 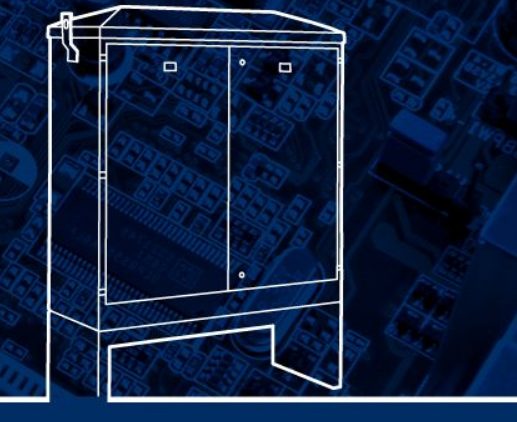 21.4 Provide a MEM Memshield 3 125A 8 way TPN distribution unit to the landlords feeder pillar. 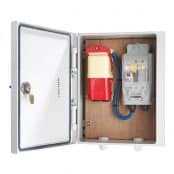 21.5 Provide attendance for electricity meter installation. 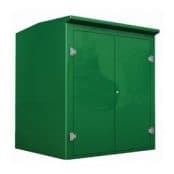 21.6 Provide 16sqmm 6491X single core PVC cable tails for DNO ISU in 100mm galvanised trunking. 21.7 Provide local isolator to DNO ISU electrical intake. 21.8 Cable from isolator to DB in 16sqmm 6944X (4 core cable) + 10sqmm CPC 6419X. 21.9 Refer to feeder pillar distribution board schedule for further details. 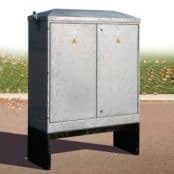 21.10 Provide 4 number 90mm twinwall cable ducts through concrete base for buried electrical service connections. 22.1 The front canopies are to be to be partially stripped and altered. 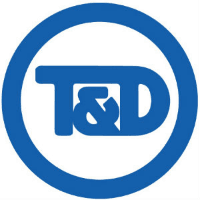 22.2 Refer to the removal of services section for necessary removals and adaptations necessary to effect the works. 22.3 New ambient down lighting shall be provided to the canopies as detailed on the drawing. Provide new luminaires as detailed on drawing. The existing electrical and lighting circuits have been identified on the as installed information (provided for reference) and utilised for the new lighting. Each unit has an independent circuit. Identify existing feed and extend the circuit to the new luminaires. New cabling to be 1.5sqmm 3182B flexible Low Smoke Zero Halogen (LSZH) cable. 22.4 Provide connections to proposed canopy bus stop signs as detailed on the drawing. These signs shall be wired off the existing canopy lighting circuits. New cabling to be 1.5sqmmmm 3182B. 22.5 Dependant on phasing, alterations to the canopy will expose circuits running through one canopy onto the next. Allow to dress and protect these electrical circuits during the course of the works. A downloadable specification form is available to initiate the electrical engineering design of all Lucy Zodion type feeder pillars. 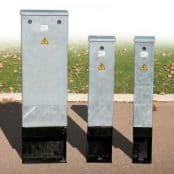 Custom Feeder Pillars are readily available in a range of special and format feeder pillars to meet specific applications; they can be made from galvanised steel , or stainless steel and can be painted to suit the customers individual needs. Key Products: MV-HV Cable Joints & Terminations, Cable Cleats, Duct Seals, Cable Transits, Underground Cable Protection, Cable Jointing Tools, Feeder Pillars, Cable Ducting, Earthing & Lightning Protection, Electrical Safety, Cable Glands, Arc Flash Clothing & Fusegear.